What a mess. You've added your favorite TSRs (memory-resident programs): a DOS shell, a clock, a notepad, a macro program, and an appointment calendar. You'd like to add a financial calculator, a print spooler, and a game or two. But each time you add another TSR, something else doesn't work. If you add the financial calculator, your notepad won't load. If you add the print spooler, your modern program locks up. If you add either of the games, you run out of memory. The problem comes from the way DOS places programs into your computer's memory. First, DOS loads itself into the bottom part of your memory. Next, it loads your TSRs on top of DOS according to your autoexec.bat file. Then, you innocently try to load your industrial-strength application on top of everything else, and uh-oh, you're out of memory. Like Oliver Twist, you want more But you're tired of the jigsaw puzzle where you try to fit in one piece only to see another piece jump out. You need help. You need PopDrop. PopDrop works by dividing your memory into as many as 16 layers. When you first load PopDrop. it uses a small amount of memory (about 0.6K) to store the system status. Then, when you load your TSRs, they're loaded into layers on top of PopDrop, with a PopDrop layer (taking up 0.2K) placed between each TSR. Now you can remove all the layers at a time (using the popdrop clear command), remove all TSRs above any layer (with the popdrop # command) remove all layers and PopDrop itself (with the popdrop stop command), temporarily make all or any combination of layers inactive (with the popdrop i and popdrop i #, # commands), and reactivate all or any combination of layers (with the popdrop a and popdrop a #,# commands). You can also display a screen diagram with the popdrop view command. It shows each PopDrop layer, the name of each TSR (with DOS 3.0 or higher), the amount of memory used by each layer, the memory used by each layer, the memory used, and the memory available. The popdrop view command can also act like a help screen. It lists the PopDrop commands and offers the option to run any of them with a single keystroke. If you would like to dig a little deeper into the inner workings of combining TSRs, you can display a hooks diagram with the popdrop hooks command, RAM-resident programs use interrupt vectors to hook into DOS. If they don't follow the rules, or even if they do, there can be conflicts when programs write to the same address. PopDrop's hooks diagram lists the vectors booked by each program, allowing you to identify combinations where the loading sequence may be critical. PopDrop is supplied in three forms: POPDROP.COM (the normal version), POPPRO.COM (a smaller version that displays only start-up and error messages), and POPDROP.SYS (for EMS, or Expanded Memory Specification). The package also includes an excellent disk-based tutorial which explains how to use the various commands and how to use the program with batch files. The tutorial also has a questions/problems section that covers special situations, such as how to use PopDrop with DOS-shell, network, and terminal-emulation programs. To give PopDrop a workout, I tried it on my PC-compatible laptop. I like the RAM-resident program. No-Squint Laptop Cursor, which makes the cursor more visible on an LCD screen. It works fine in XyWrite, where I need it most, but it crashes Tetris, With PopDrop, I was able to make No-squint inactive, load Tetris. quit Tetris. make No-Squint active again, and return to XyWrite—all with no problems. PopDrop worked equally well with other combinations of TSRs and applications. PopDrop is a useful utility for those of us who like to stuff as much as we can into our PCs. It uses only a small amount of memory and has a good mix of features. 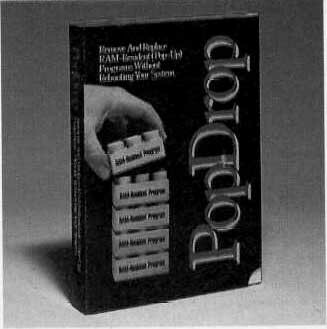 While PopDrop might be easier to use if it were also a memory resident program, even in its present form it makes life with DOS a bit more manageable.